Just when you think Archie has found a happy medium in his relationships with Betty and Veronica, he goes and does something stupid. This time, however, the "Over the Edge" arc promises to change the Riverdale kids forever. Could Archie's bad decision this time spell doom for someone we know? Archie #20 opens with an ominous recap of just what kind of jerk Reggie Mantle is. Archie explains that Reggie enjoys bullying people and being entirely obnoxious. It kind of foreshadow what's to come. Perhaps, in an homage to the hit live-action drama on the CW, Riverdale, Archie is shirtless while "helping" Betty help restore Archie’s grandfather’s 1969 Mach 1 Cobra Jet Mustang. A very sweet and rare ride that's been a passion project for the lifelong friends even though Betty's the one with the mechanical know-how. They'll finally get to go on that joyride they've been dreaming about for years if Archie doesn't forget to gas it up first. It's a convenient set-up as Reggie appears later to force Archie into a drag race for pink slips. Archie's decision to try to keep something from Veronica allows himself to be compromised. Once again, he screws Betty over in the process. What's always been maddening as an Archie Comics fan is Archie's knuckle-headed thought-process. I suppose that's the point of this near century love-triangle between Betty-Archie-Veronica where he takes for granted what's in front of him for the girl he thinks is more desirable but not the nicest. However, you don't screw over your friends, male or female, and you certainly don't let yourself be bullied by the school jerk either. Yet, Archie does both and sets in motion a series of events that will prove the book's hype as a life-changer. Mark Waid has done some of his best work in his career on this series and always finds new ways to develop some sticky situations for our heroes and this time he might be going the serious route as the story unfolds. He certainly is in tune with his younger self and he makes these "kids" talk and act like the characters you know but with a modern sensibility. It seemed in this issue those personality traits got super-concentrated making them act in a hurried way becoming almost a parody of themselves. Still, Waid salvages the story by making it suspenseful and closing it out with a major cliffhanger. The one head-scratching moment is with the Blossom family subplot. It's wedged into this issue but doesn't advance the story or serve an apparent purpose. Pete Woods does an overall great job laying out the story and creating expressive character designs that give the story the urgency and emotional lift it needs. The one thing that can't go unnoticed is the lack of detail in some of the backgrounds. When the characters get further and further away from the "camera" their faces lose significant features, almost like blobs. It's so obvious I had to mention it but everything else about the art is just fine. 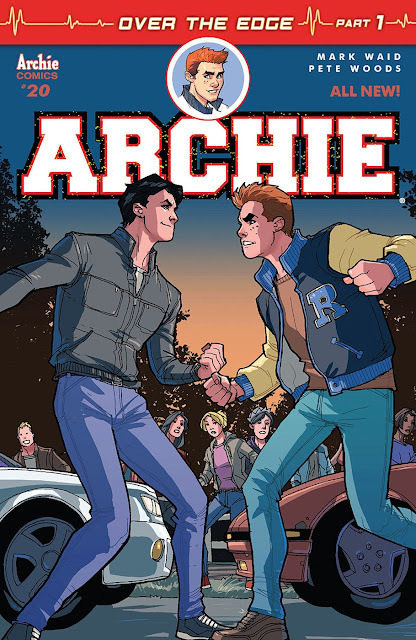 Archie #20 is the catalyst for the new "Over the Edge" story arc and the stakes couldn't be higher. Archie has gotten himself and his friends in such a hot mess this time someone may not find themselves out of it. Waid and Woods are making sure this story lives up to the hype and so far so good.